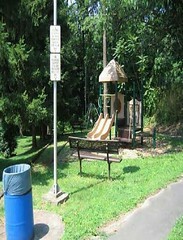 Sullivan Park features a tot lot, a basketball court, and a limited trail system. Above the playground area there is a well maintained grass field with a small wetlands area behind it. This is a great area to throw a ball, read a book in the sun, or to just come and relax in. The area is easily accessible yet quiet and personal.